I blame this dress on Stevie Wonder, and my inability to keep dates straight when it's SUMMERSUMMERSUMMER. Last weekend, I suddenly realized it was the end of July, and I with no MSN project for the month! I mean, I'd planned not one, but two projects for this Hotter-Than-July, and hadn't touched a scrap of fabric on either. Both were panel prints--I do like a theme--and both were jersey. This gal is an Italian Poly, and her mate was Italian Cotton. Again, themes. I went for the cotton first, as the fabric content was a bit higher brow. BECAUSE I'M CLASSY. However, the Cotton jersey went south quickly. Welllllllll...not quickly...more like a marathon day of sewing's worth of south. It ended up in the What Was I Drinking bin, which mainly holds cooler weather projects at the moment. Glad to have something summery to stagger down memory lane with! It'll be coming up shortly. I gnashed my teeth and stomped my feet a bit, loaded all of Stevie's albums, and cut into the second panel print to the tune of "Did I Hear You Say You Love Me." By the time I got to "All Day Sucker," I was shaking my booty in front of the bedroom mirror like I was at a barbecue with seven spritzers in me, slight heat exhaustion, and my all time favorite song on. THEN I TURNED AROUND AND REALLY STARTED BOOGEYING ON REGGAE WOMAN. YEEEEEEAH PRINT PLACEMENT!!!! You know I love those (intentionally) placed cascading flowers, right?! YOU KNOW RUGGY CAN'T STAND THEM, RIGHT?!!! Shall we talk about the sewing for a minute? OH LET'S DO. After the botchery of my first panel try, I needed something quick that would make good use of the second print. Burda Magazine 07-2009-124 Halter Tie Dress to the rescue. It’s supposed to have a wrap back, but to make it even easier on myself, I modified the pattern into 2 on-the-fold pieces. I just used the CB placement marking as my foldline. Two pattern pieces, two panels, add slits, make a tie, whambamthankyama’am, July project saved! I also used a good bit of Steam-A-Seam Lite in this jammy. This poly wasn't about to keep a crease on its own! 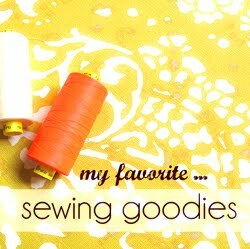 Which reminds me, I need to get another Sewing Goodies post up in here. For now, here's the link to my favorite size, a two pack of 1/4" Steam-A-Seam Lite. (That link is affiliated, so cut & paste if you're not into that!) I'll have a proper review up soon, but I've already had three orders of this stuff--I love it. It's a reposition-able double stick tape that sets permanently with steam and heat--like Wonder Tape, but I prefer SAS! You don't lose the stretch of the fabric with this stuff. I used it on the side slits, hem, and neckline of this dress. I suppose you could heat set it and forget it, but I use it to keep the fabric nice and flat for topstitching. If you don't have a serger or coverstitch, this really helps in keeping things looking professional. Make sure you get the "Lite!" Nothing Lite about this panel print, that's for sure. I find panel prints not only make you think out of the box, they almost do the work for you. And this one sure saved my tuchus this time around! Ever tried one? 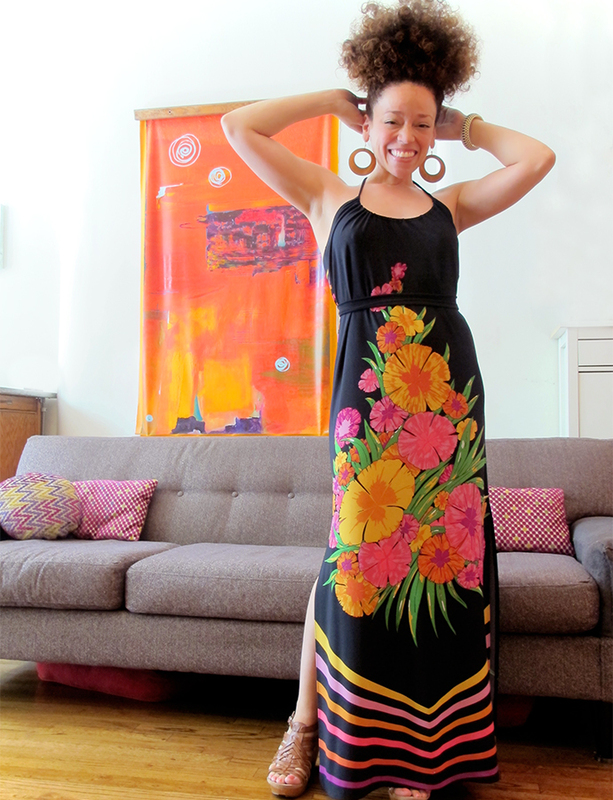 this dress was made with my monthly fabric allowance as part of the mood sewing network. thanks for the (wonderful) stevie earworm, mood! All the loves for this dress. And you in it!! Wow, that's fabulous and just what I needed on this sleepy afternoon. Can't wait to see the What Was I Drinking panel, though, since it seems to me that everything I attempt could technically fall into that bin (if I had one, and if I drank much). Your dress is a wonderful use of a print panel. I would really enjoy wearing a dress like that! I recently made a panel dress using the white knit print from mood which you made into harem pants. I like your harem pants but my white dress is not a favorite. I let the print push me to make a design decision that I regret. Batwing sleeves don't look right on me! When I post a photo on my blog I will send you a photo. Thanks for sharing your design work. that print was pretty hard! please do send me a link, i'd love to see what you did with it. im sorry but i am beginning to think that ruggy doesnt have good taste because....WOWZA!! (insert roger rabbit bug eyes). i have never worked with a panel print. you make it look so effortless and cool. Beautiful!!! 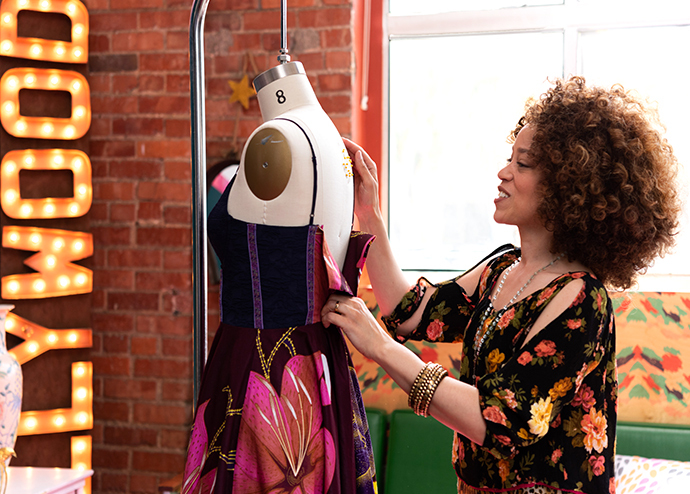 Love your dress and the fabric is gorgeous. Love this! Love the way you used the panel and I've pooted a flower panel print or two myself...so you're in good company! ugh, melting!! be sure you use plenty of steam and a press cloth with this stuff, it's magic. awesome!! and, you know, *boys*. I love everything about this dress- especially the flower placement! You are the Queeeeeen of that, you know. How amazing! One of my favorites for sure. LOLOLOLOL...farting flowers. That is hilarious....what can I say, when it comes to humour, I'm a sixth grade school boy at heart. Okay...I've regained my composure. You look sublime Oona. This silhouette gives the illusion of mile long legs. Summer? Hot? It's just not happening here on the west coast. All the love for this dress!!!!!! Oh my!!! I love this!!!! Is the pattern still available? 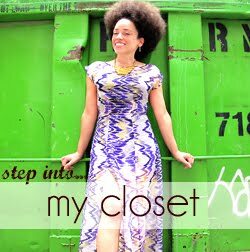 this was from the magazine, years ago-- but you might check the burdatstyle website! LOVE! Those are SO my colors. And yours too obviously; they look better on you and strangely I haven't really been sewing "my" colors much lately. I love the back. I was just saying a few minutes ago (on my blog) that I'm getting addicted low-backed dresses. you must correct course and sew your colors! The fabric is a killer (in a good way)! If my legs look as long as yours I will make it my best friend! I love the dress, I love the way you write and what you sew. I wish I had an inch of your talent. oh, thank you! but i'm sure you have several inches, if not yards, of talent! This is fabulous! And I'm with you on the steam-a-seam lite -- I keep it around in both the 1/4" and 1/2"! OMG ARE YOU A UNICORN?!? ROFL - This will forever be your farting flowers dress to me. I actually love the print placement. It really works and brings the wow factor. You look fabulous doll!!! Beautiful job!!! The dress screams, "Summer! ", your armpits are pristine (men notice these things), and you look like the life of any party, sidewalk, or subway car. Now, where are the men from Kalkatroona?? HAHA. growing up in ballet will do that to you ;). If you fart flowers, then you might sweat morning dew. No complaints. That dress is fantastic! Love the stripes on the back. um: sweating morning dew? THAT'S AMAZING. And I totally snickered at that, Ruggy! Great dress, and the cascading flowers of flatulence are fantastic - Ruggy doesn't know what he's talking about! 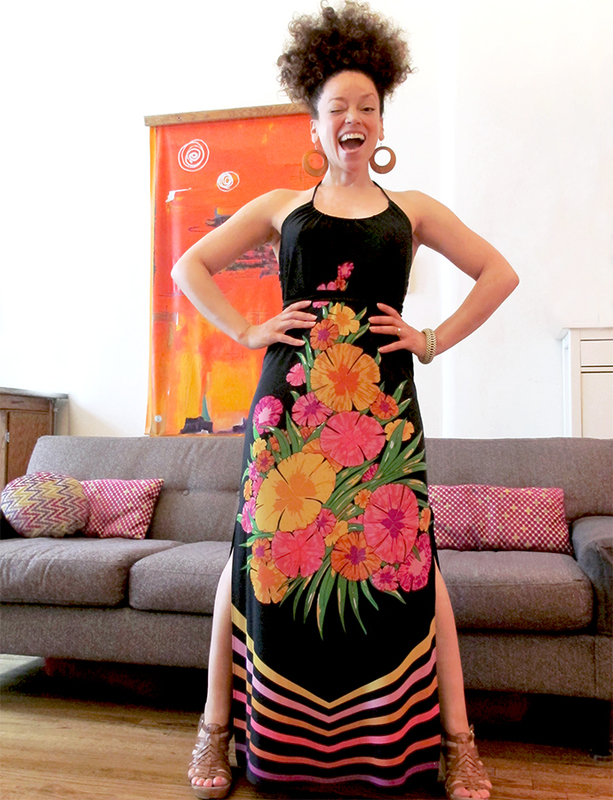 Ooooo Oona your beautiful dress is making me want to maxi it on up! love the flower placement! and MAN how satisfying is a 2 panel dress? Anything that I can lay out, cut, sew and clean up before the husband gets home is a win win wine win (wine? why not?) in my book. Love your blog, just found it, and am a fellow sewist. Never heard of steam a seam but might have to get my hands on a few hundred yards soon. thanks for the rec! love yours too, glad you hollered here! Ahhhh !!! How did I miss this one? Love it! Those are beautiful flower farts. So there I was binge watching NCIS while sewing and I look up to see a familiar face. Carli/Marci/Ms. Oona herself is on my T.V. I just fan girl squealed! !!! You're so freaking cute and amazing. haha!! i loved that episode, such a fun character to play! Awmazing dress - and I love the print placement!